After many years of trying, I finally got my husband to start using skin care YAY! The thing that hasn’t been such a celebration is sharing a bathroom with someone who was new to skin care and seeing how badly he both over used soooo many products and misused them. I started to think, how many people may be doing the same thing? Going through their valuable products quicker than they should be? Or not seeing as significant results as they should be because potentially their active products aren’t being used to their full potential? Because I can’t be standing beside each and every one of your gorgeous faces whilst you apply your products every morning and evening, like I could with my husband, I thought I’d put together a guide with some product usage tips that WILL make a big difference to not only how your skin feels but how often you need to restock them. If using a milk or gel cleanser, use a full pea sized amount for each cleanse. If you have a foaming cleanser, you really don’t need too much at all. I would recommend a half a pea size for each cleanse. When mixed with water and foamed, it will go a long way. 2-3 pumps – Serum isn’t designed to feel “saturated”. You really only need enough to spread quickly over your face and absorb. Not so much that you “moisturised”. Your moisturiser will take care of that. 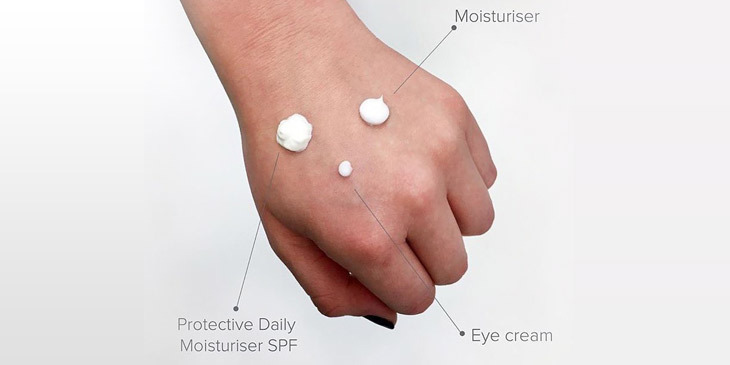 Your active treatment products are the ones that can biologically change the skin so check with your therapist to make sure you are using your Vitamin A, Vitamin C and liquid exfoliants in the right quantities, applying them correctly and using them at the right time of day- Little changes can make a big difference! This one is about a pea sized amount- maybe a tiny little bit more to cover your neck and chest too. You may need to add a little more depending on the formulation. About the size of a grain of rice, split between BOTH eyes. Eye creams that include Vitamin A and C should only be applied under the eye area and to the brow bone where as a hydrating eye cream without active ingredients can be spread all over your eyes, lid included. Our helpful Navanah Skin Experts are always here to help, you can call us at the salon or email us any time with you skin care questions and we will get back to you asap. The New Revolutionary Technology to Combat AgeingWhat lies beneath your skin?